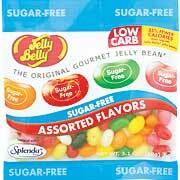 Earlier this month, we noted the release of low-carb Jelly Belly candies. Coming in several flavors, the new products use Splenda (instead of sugar) to cut carbs. However, they load up the products with sugar alcohols to futher reduce the effect of carbohydrates, which may make these candies impractical for some dieters. We tasted each product that was announced, a total of 8 different varieties: Sugar-Free Jelly Belly Beans, Sugar-Free Jelly Belly Sours, Sugar-Free Fruit Slices, Fruit Drops, Spice Drops, Cola Bottles, Gummi Inchworms, and Gummi Bears. Each tasted much like their carb-laden counterparts. bq. Consumption may cause stomach discomfort and/or a laxative effect. Individual tolerance will vary; we suggest starting with 8 beans or less. We did not experience this (or even see the warning until way past 8 candies), but everyone is different. Obviously a candy that irritates the stomach is not practical. Since we did enjoy the candy, we’re going to leave the final call up to you and your stomach. For us, they are everything they claim to be. Polydextrose, maltitol syrup, maltitol, modified food sstarch, contains 2% or less of the following: sucralose (Splenda), citric acid, natural and artificial flavors, color added, blue 2 lake, yellow 5&6 lake, yellow 5&6, red 40, red 40 lake, blue 1, tapioca dextrin, beeswax, carnauba wax, confectioner’s glaze, salt.